CCS Presentation Systems, a New England based audiovisual integrator, recently completed an AV installation project at Mount Holyoke College, a liberal arts college for women in South Hadley, Massachusetts. The college’s chapels, the Abbey Chapel and Inter-Faith Chapel, needed to attain adequate sound quality for both music and speech. In previous efforts to correct the problem, several sound systems were installed and modifications were made to the ceiling for the organs, helping acoustically, but not vocally. Through a collaborative effort between Mount Holyoke’s Design & Engineering Team within the Media Services Department and CCS, a strategy was devised to create sound clarity for both speech and music. 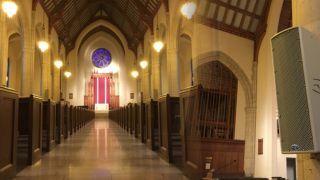 An updated, easy to use speech reinforcement and audio playback recording system would be placed in the Abbey Chapel, with a smaller system in the Inter-Faith Chapel. New microphones, mixers/amplifiers and other system components would be integrated into the space. Speakers from Danley Sound Labs would be installed into the main Abbey Chapel. Danley’s speakers have a proprietary design, providing the acoustical pattern control of the common line array speakers, without the labor intensive setup of the common line array. These speakers also provide the ability to control the audio pattern, meaning that no matter the pitch of the voice spoken into the microphone, the sound projected would be clear. Additionally, CCS added audio feeds to enhance live streaming for future chapel events. The final result: The Abbey and Inter-Faith Chapels now have clear, high quality vocal and acoustic sound with constant intelligibility. Audience participation has increased. Best of all, the chapels were technologically enhanced without compromising the integrity of their original, historic design.